This paper looks at how the emotion of shame was conceived around early modern public execution and, further, how shame was then portrayed in the broadside ballads that broadcast information about executions. It seems paradoxical that in the moments before their death condemned criminals were deeply concerned about the shame their punishment would create. Why would a person about to die care about feeling shame? I explore how, in contrast to our current understanding of it as a private, personal emotion, shame was conceived as a communal emotion in the early modern period, one that people shared and which had tangible consequences for one’s family and friends. In that sense, can shame even be considered an emotion in early modern thought? I discuss these issues from the perspective of the ballads that were sung about these executions. How did balladry perpetuate – or subvert – the message of shame that was central to the purpose of execution? Una McIlvenna is Hansen Lecturer in History at the University of Melbourne. Her research interests lie in the fields of early modern cultural and literary history, which she has previously taught at Queen Mary University of London and the University of Kent. From 2011-2014 she was a Postdoctoral Research Fellow with the ARC Centre for the History of Emotions, based at the University of Sydney, where she began her ongoing project investigating emotional responses to the use of songs and verse in accounts of crime and public execution across Europe. She has published articles on execution ballads in Past & Present and Huntington Library Quarterly and is currently working on a monograph entitled ‘Singing the News of Death: Execution Ballads in Europe 1550-1900’. Her recent work on this project has widened into considering news-songs on numerous topics, including natural disasters and wonders, military battles and sieges and politics and social satire. In the summer of 1484, a fresco of the Madonna and Child Enthroned in the Tuscan town of Prato miraculously came to life. Hoping to receive relief from their troubles, pilgrims from the surrounding countryside began gathering around the image, which was painted on an abandoned prison and located in an impoverished area of town. Despite the marginal nature of the fresco’s location, the image’s devotees insisted that the prison’s structure be enshrined within the new church that was being built to house the popular cult. This sudden surge in devotion to a peripherally located miraculous image was part of a larger religious phenomenon in the late fifteenth century, a time when Marian image cults proliferated in the territory controlled by Florence. Focusing on the case study of Santa Maria delle Carceri in Prato, this paper will highlight the ways in which the cult strengthened the peoples’ ties to their own town rather than to the expansive Florentine state. I will employ Edward Casey’s theory of place to analyze how the rituals and founding miracles associated with the cult worked to ground the miraculous image and the devotees in the place of the abandoned prison. Shannon Gilmore is a PhD Candidate with the Department of the History of Art and Architecture at the University of California, Santa Barbara. In 2009, she was awarded her MA in Italian Renaissance Art History from Syracuse University, having been selected as a fellow in their program based in Florence, Italy. She currently specializes in late medieval and Renaissance devotional painting in Central Italy, with a particular emphasis on theories of place and ritual. Her essay, “Ritually Reconstructing Calvary: Sacred Space and Gender at the House of Mary in Ephesus," was accepted for publication in the forthcoming edited volume, Civic and Domestic Religion in Ancient Ephesos. Recently uncovered papal documents from the archives of Rome's Jewish community shed new light on the shifting social and political conditions of Jews in Italy in the early seventeenth century. This paper will consider the questions raised by a papal bull issued under Paul V in 1609 that has not been previously included in the historiography. The context of the bull reveals new understandings of the rights and restrictions of Italian Jews, as well as the tensions that existed specifically between the leaderships of the papal states and the Venetian republic. Rebecca Wartell Lobel is a PhD candidate in Early Modern History at Monash University. Her thesis is currently titled: 'Escaping the Sword of the Inquisition’: Themes of conversion, expulsion, and resettlement in early modern Sephardi rabbinic texts. Rebecca's areas of interest include Jewish migration, texts of Mediterranean Jewish communities, and Jewish/Christian and Jewish/Muslim relations. Rebecca has a Master's degree in Theological Studies from Harvard University. This paper will analyse how women and men interacted with the complex and often opaque negotiations surrounding the conclusion of sieges during the period 1640s and 50s in Ireland. The paper will use the documents known as the “1641 Depositions”, the records of the trials of rebels in the High Court in 1652/3, the petitions for compensation as well as contemporary narrative descriptions. Sieges often involved non-combatants and there is a large body of contemporary evidence by and about women in these circumstances. There has been interesting scholarly attention paid to women who led the defence of their homes in the absence of their husbands, such as Lady Elizabeth Dowdall and Lettice Digby, Baroness of Offaly. Less attention has been paid to women who had lesser roles in sieges. These women are however often described as intervening in the decisions to seek quarter and to evacuate castles after defences were beaten, such as Martha Piggott of Dysart castle who described how she begged her husband John to seek quarter as it became clear that the castle was being overrun by Confederate forces. Emotive language used when seeking quarter or ending sieges was inflected by gender as well as class and military position. In the murky legal contexts of the conclusion of sieges, women and men occupied different positions, which could be used rhetorically to justify actions such as seeking quarter or not fulfilling articles of quarter. Dr Dianne Hall is Senior Lecturer in History at Victoria University, Melbourne. She has published widely on the histories of violence, gender, religion, race and emotion in medieval and early modern Ireland and the nineteenth-century Irish diaspora. She is currently working on a monograph with Professor Elizabeth Malcolm on gender and violence in Ireland from 1200 to 1900. She has held post-doctoral research fellowships in the School of History at University of Melbourne and School of Geography, Queen's University, Belfast before joining Victoria University. This paper will address the cultural patronage (“matronage”) of Grand Duchess of Tuscany Vittoria della Rovere via an examination of the virtuoso women artists, musicians and writers she supported throughout her long life. Victoria was an active matron of the arts who gathered round her some of the most important female cultural producers of the day, sponsoring their creative work and developing their talent. Some of these women were her ladies-in-waiting, whom she educated as artists, musicians or embroiderers as part of their cultural development and future roles at the Medici court. Others were professional artists whom she patronized or called to her court as resident artists. In particular Vittoria appreciated the cultural production of the painters Giovanna Garzoni, Elisabetta Sirani, Margherita Caffi, Camilla Guerrieri Nati, Giovanna Fratellini; the composer Barbara Strozzi; singers Francesca Caccini and her daughter Margherita Signorini, Luisa Marsia, Maria Caterina Piccioli; the actress Beatrice Vitali; and the writers Arcangela Tarabotti, Maria Selvaggia Borghini and Barbara Tigliamochi degli Albizzi. The paper will finish with a discussion of Le Assicurate, the all female literary academy founded in Siena in 1654 under the “patroncinio” of Vittoria della Rovere. Unpublished archival material from the Archivio di Stato di Firenze will introduce some of these women, whilst new light will be shed on the art and lives of others. Adelina Modesti is an Honorary Associate in the Department of Archaeology and History at La Trobe University, where she was an Australian Research Council Discovery Postdoctoral Fellow in Art History, researching matronage networks in seventeenth-century Italy. She is also a member of the Florence Council of Advisors, Advancing Women Artists Foundation, and the author of numerous publications on women artists, including Elisabetta Sirani ‘Virtuosa’: Women’s Cultural Production in Early Modern Bologna (Brepols 2014) and on the cultural patronage of Medici women. Adelina is currently working on a forthcoming book for Routledge, Female Patronage and Gendered Cultural Networks in Early Modern Europe: Vittoria della Rovere, Grand Duchess of Tuscany. 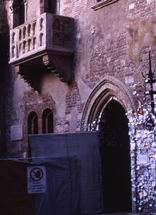 When the tomb of the medieval ruler of Verona, Cangrande della Scala (ob. 1329), was opened in 1921, it was discovered that he had been buried in a hastily assembled outfit made from local and imported silks. His hat, cape, gown and hose survived, more or less intact, along with fragments of other textiles. The major fabrics were from Central Asia, a testament to the international trade in textiles, from China to Northern Europe, in the thirteenth and fourteenth centuries, after the rise in the Mongol Empire. Yet despite intensive study, there are still disputes about where Cangrande’s silks were manufactured and how common they might have been in European contexts. This paper will use Cangrande’s textiles as a starting point to discuss larger issues of contact and exchange in the Mongol age. Before coming to Melbourne in 2015, Professor Dunlop held positions at Yale University and Tulane University. She is the author of five monographs, among them Andrea del Castagno and the Limits of Painting (2014), Early Modern Faces: European Portraits, c. 1480-1780 (2014), The Matter of Art: Materials, Practices, Cultural Logics c. 1250-1750 (2014) and Art and the Augustinian Order in Early Renaissance Italy (2007). In this paper, I discuss a specific kind of visibility used by the early modern translator: an “artistic visibility”, in which the mise en page of courtly monkeys and dogs offers visual cues for the reader and patron about the nature of the translation and the skills of the translator. I argue that the presence of monkey and dogs in manuscript and printed images accompanying early modern translation illuminate the translators’ self-aware agency and the collaborative nature of their work. Andrea Rizzi is an Australian Research Council Future Fellow (2014-2018) at the University of Melbourne . A former Fellow at The Villa I Tatti Harvard Center for Italian Renaissance Studies, he works on scribal and print cultures of Renaissance Italy, translation history and anonymity in early modern literature. His most recent publications are: Vernacular Translators in Quattrocento Italy: Scribal Culture, Authority, and Agency (Brepols, 2017) and City, Court, Academy: Language Choice in Early Modern Italy (Routledge, 2017).